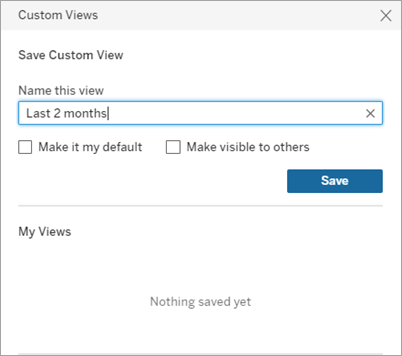 If you find yourself changing a Tableau Server or Tableau Online view every time you open it, consider saving your changes as a custom view. 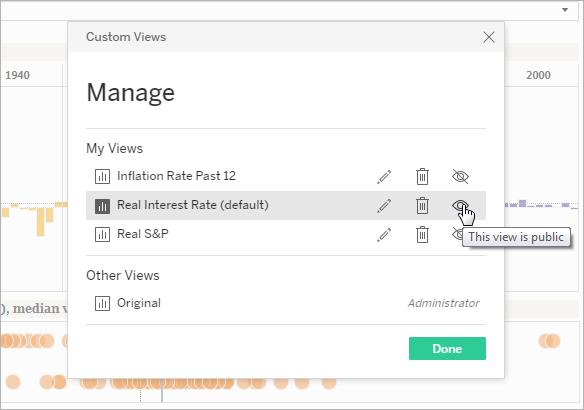 For example, if you apply a filter to include only data relevant to you, or you sort data differently, you can save separate custom views for each scenario. Tip: A custom view doesn't change the original view, but it remains related to it. 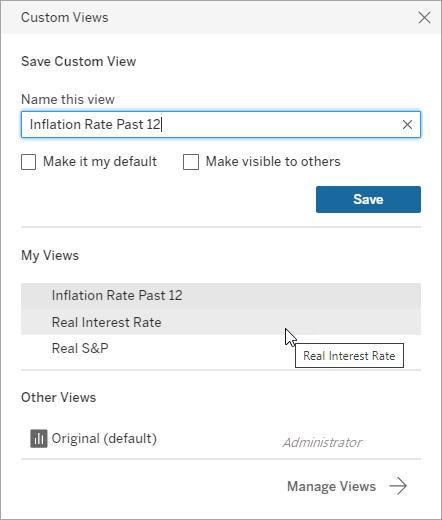 If the original view is updated or republished (with different filters, for example), your custom view is updated too. Likewise, if the original view is deleted from the server, your custom view is deleted. Filter the data, change sorting, select specific marks, zoom in or out, or make any other modifications. In the toolbar, the View option now includes an asterisk, indicating that the view has changed. Enter a name for the custom view. Then select whether you want it to be the default view you see, and if it should be public so other users can access it. The currently selected view appears with a gray background. Click another view to display it. Custom views that you have saved appear under My Views. The original view and views created by others appear under Other Views. Click View in the toolbar, and then click Manage in the lower right corner of the Custom Views dialog box. Click next to the custom view name to make the view the default view. The icon changes to to indicate that the view is now the default. By default, a custom view is private so only you see it in your list. But if your site role is Interactor or Publisher, you can make a view public so other users can see it too. 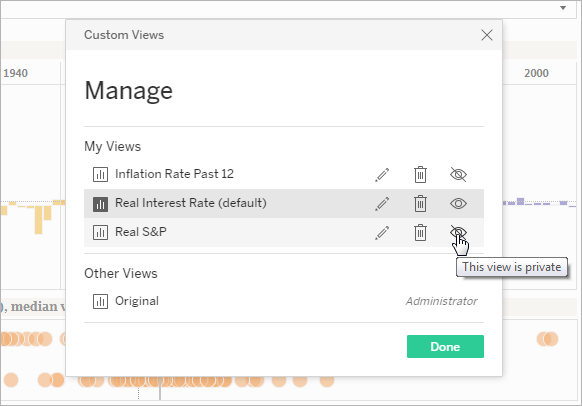 Anyone who has access to the original view will have access to your public, custom version. Click the public or private icon to change the view's status. 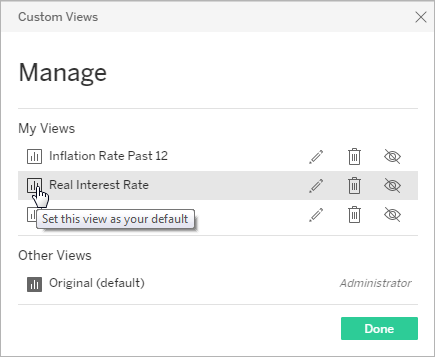 You can delete a custom view you created at any time. Removing your custom view does not affect the original view. Click the delete icon next to the custom view name.